Agricultural Services, Inc. is the crop production specialist providing area producers the best customer service and quality products to grow high yields. We remain an employee owned and operated company since 1955. We are looking for a self-starter to join our organization. You will promote a full line of fertilizers, crop protection products, and our full service business model to current and prospective customers. Recommend high yielding fertility programs, designed to maximize yield potential based off soil and/or tissue analysis results. Stay abreast on the latest technologies and promote the proper use of those technologies and products. Manage your time effectively as much of your time will be spent visiting with current and prospective customers away from the office. Establish and maintain a positive and professional public presence. Coordinate work orders with the Location Manager to efficiently get products applied and/or delivered. Work with sales team to develop a sales plan to turn prospective customers into current customers. Work extended seasonal hours to meet customer’s expectations. Work as a positive and respectful team player with the rest of the location team. Perform other duties as assigned by the Location Manager. 2 – 3 years agriculture sales/scouting experience. 3 – 5 years sales experience. 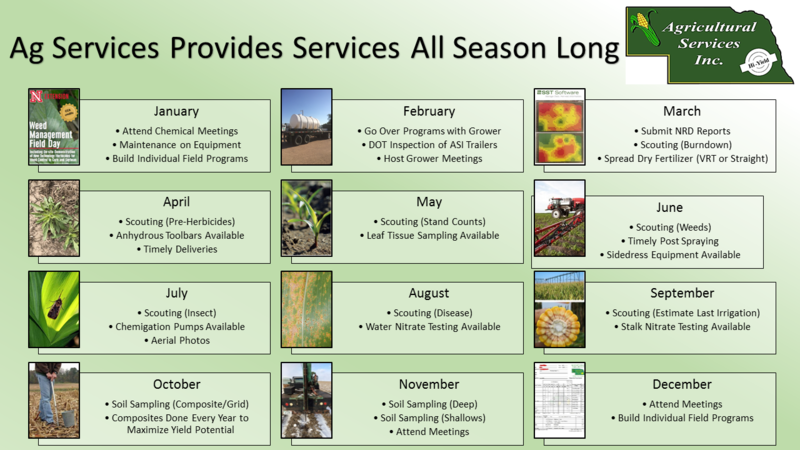 3 – 5 years Agronomy experience. Agricultural Services offers a competitive compensation package. Benefits include: Health, Dental, Vision, and Life insurance, Paid Vacation, Company funded retirement plan, and a Company Vehicle.